I had a browse in the local kitchen shop today. Although we are pretty well set for kitchen stuff I do like to see what's around, both silly and useful. Despite trying to stick to a minimal gadget rule in the kitchen, I have been meaning to buy an apple peelers for ages. Seems silly to live in the apple valley on the apple isle and not have one. On sale for less than twenty dollars today I snapped it up, grabbed a few kilos of pink ladies and Hugo and I got to work. Almost looking like a torture device, this baby peels, slices and cores, without electricity. And for a family who go through at least six kilos of apples a week, it's money well spent. We filled the dehydrator pretty quickly and by tomorrow should have delish dried apple treats. Hugo loves to eat the skin and there are cores left over for the chooks. A big pot of apples is also cooking for a crumble tonight, filling the kitchen with the most delicious homely smell. It only took minutes to prepare them. Life is pretty hectic at the moment, next week is school holidays and I can't wait. I think we're all a bit tired. We're going to stay in our pyjamas all day and hang out. 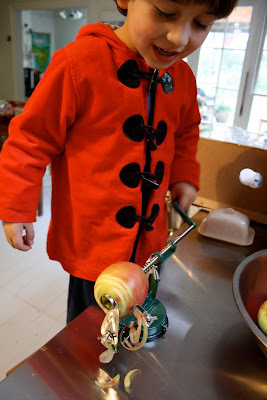 But it was fun to have a little one on one time with Hugo playing with our new kitchen toy. A fun gadget well worth it I reckon. But I can not see the point in an avocado slicer. I have just stumbled across your blog and had to say how lovely it is! Your cupcakes look devine if only I lived in Tasmania. I also live in the apple valley of Tasmania and also bought myself one of those apple gizmos! But it doesn't peel for me. I ordered mine from Fowlers when I bought the dehydrator (for the apples - great minds think alike)and it only removes the peel from the last 2 cms of apple. Is there a trick, a knack or do you have to hold your mouth a certain way? At the moment it is stashed in a bottom drawer in detention! Any hints or tips gratefully received. What a great idea, have often thought about getting one of those but didn't realise they are so well priced! There is never a shortage of apples in our Tassie kitchen either, so anything that makes preperation time quicker and easier is fantastic! with leonie on that one.